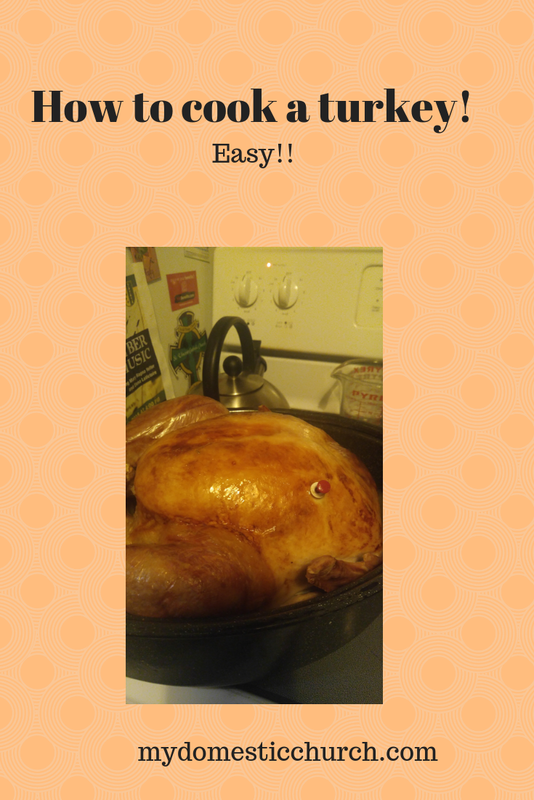 Super Easy How to Cook a Turkey! Over in my Facebook Feeds, I keep finding folks that are stressed out about cooking a turkey. They don't know how to thaw it, or how long to cook it and everyone seems deathly afraid of contracting food poisoning. Fear not friends! Turkey is one of the EASIEST things to prepare. In fact, Mr. Pete will buy turkey several times during the year and I'll fix it because it will feed my family for a week with the leftovers - turkey salad, turkey soup, turkey tetrazzini, turkey tacos... the leftover possibilities are endless. But before you get to those tasty morsels, you have to actually cook the turkey and if you're here reading this, that's probably what you care about the most too. So here goes. This is what I do. It's also what my grandma did. We are not professional cooks. But no one has gotten sick or died. If it makes you uneasy, don't do it. The night before I want to cook the turkey for dinner, I fill my sink with cold water and ice cubes, and I put my frozen solid 12 to 17-pound turkey in the sink. Then I go to bed and leave it there. The experts say you need to change the water every 30 minutes. Do that if you want. I want to sleep. In the morning when I wake up, VOILA!, it's thawed. I pull out the giblets. If they are still frozen in the turkey, running cold water on it will help it to thaw and then you can pull them out. If you're not ready to cook the turkey yet, put it back in the refrigerator until you are. It takes time to cook a turkey, so make sure you plan ahead. 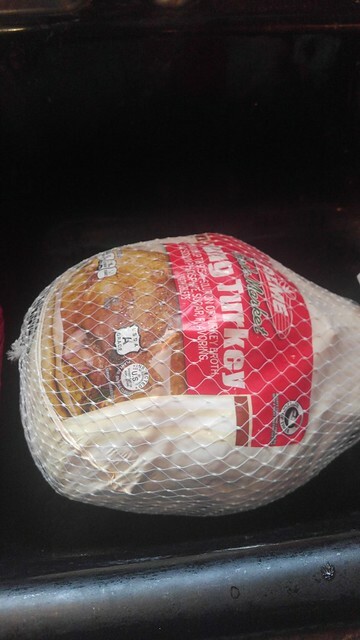 I cooked a 16-pound turkey yesterday. I put it in four hours before we were ready to eat. Here is a cooking guide for times. When I am ready to cook the bird, I preheat the oven to 350 degrees. 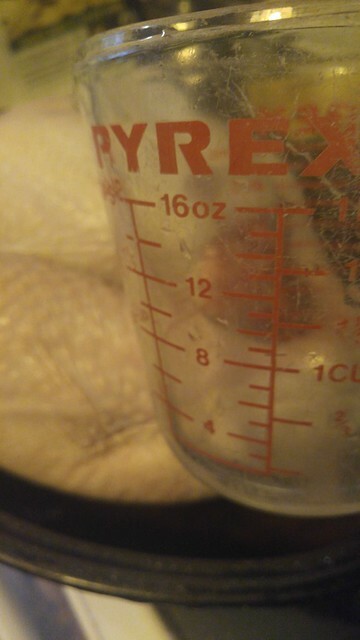 I put it in my turkey pan (breast side up) and add 2 cups of water. You can cut up and onion and carrots if you wish to put in the water with the turkey. But if you're in a hurry, you don't have to. 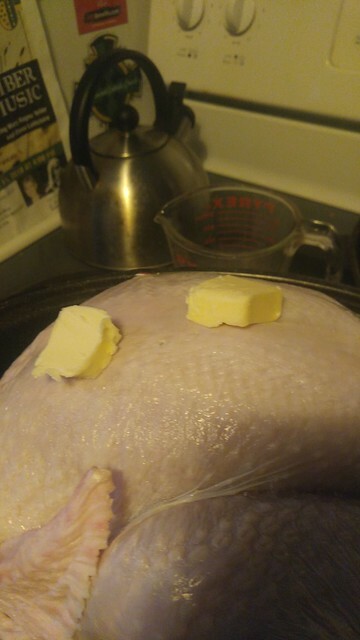 Then I take pats of butter and rub the entire surface of the turkey. Then I salt and pepper the whole thing. Before I put it in the oven, I cover the turkey with a sheet of aluminum foil being very careful not to let the foil touch the turkey. If the foil touches the turkey it will pull the skin off when you take away the foil and that makes for a bad looking turkey on the table! Plus you shouldn't waste that tasty skin! So just keep it off the bird. Put the turkey in the oven. 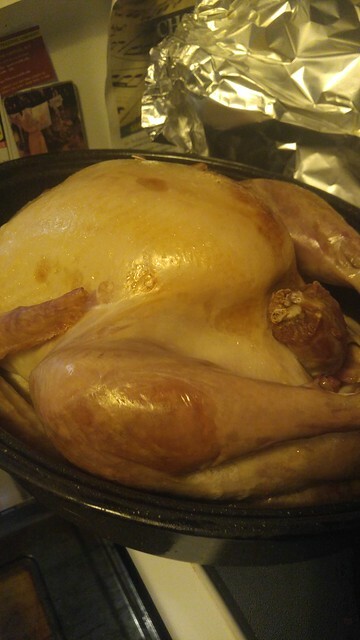 You can baste it with the turkey juices from time to time if you want, but the foil tenting should keep the bird moist. It takes about 4 hours for a 17- pound bird to cook. About an hour before the turkey is done, pull back the foil to let the bird brown. Then you have to keep a close eye because you don't want it to over brown. If it does, just put the foil back over it. 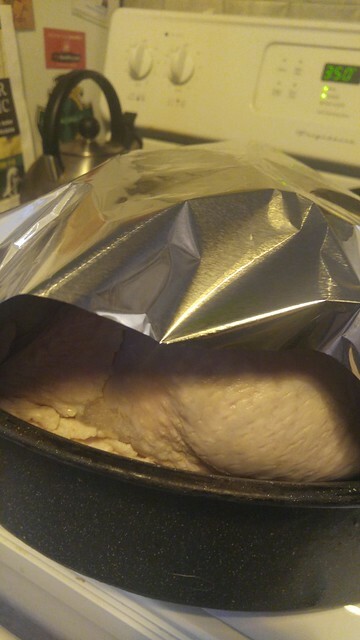 At that point, you won't have to worry about the foil touching the skin because it will be cooked already. 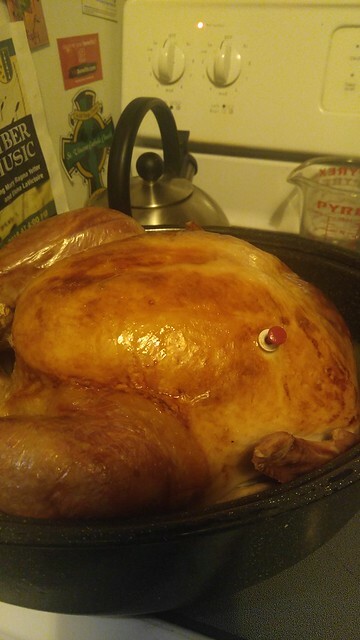 When the button on the turkey pops up, it's done! You can pull it out of the oven at that point, let it cool a little before you slice it up. That's it! Basic Turkey cooking.